kyklosphaira wing tsun kung fu blog: What is Biu-Tze and how do we train it? Early on in my Wing Tsun (WT) training, I used to focus learning the techniques. I don’t think this was an issue though. When we first start out learning a skill, the mindset isn’t necessarily there for concepts and ideas yet. When it came to Biu-Tze, I had thought that it was, as it was described by some, a secret “closed-curtain” technique. But, again the emphasis was on Biu-Tze being a “technique”. Even so, it was supposedly an emergency-response technique that could counter all. Later on, with Wing Tsun being a passion, I had looked at books, posters, and later found videos about Biu-Tze. Eventually, after officially learning the Biu-Tze form and subsequently Chi Sau sections from Si-Fu Ralph Haenel of Wing Tsun Kung Fu Vancouver (and still continuously learning in fact), I thought briefly wow, now I am at the next level… I now had this secret “finger-darting” technique! How formidable! By then, however, I realized that Biu-Tze was an entirely different movement pattern, requiring certain body mechanics I was missing. I had much work to do, even the basics of stretching and gaining even more mobility in my spine and shoulder girdle, for example. The wonderful aspect of learning Wing Tsun from Si-Fu Ralph is that at one point, the whole WT spectrum from start to finish is shown, taught, and explained. We need to be able to connect the dots, from the Wing Tsun Student Programs all the way to Bart Cham Dao. These are the connections that allow our Wing Tsun mind to grow internally, and thus our Wing Tsun externally. How do you get better in Biu-Tze? 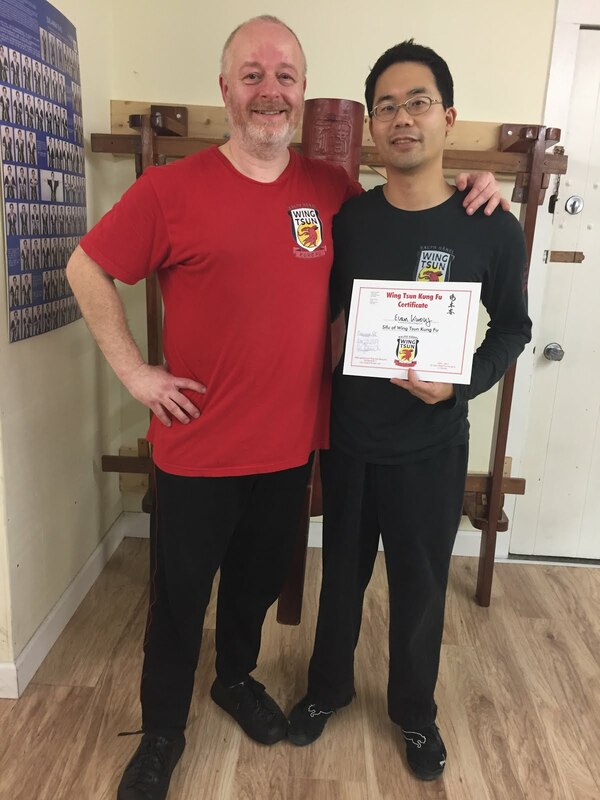 Luckily, there are many different training partners in Vancouver, and we go through the spectrum of Wing Tsun not only in seminars, but also in group classes and private lessons. If training Biu-Tze is supposed to change the way we move and improve our Wing Tsun, how are we supposed to train Biu-Tze? When we first started out training Wing Tsun with Siu-Nim-Tau (SNT), we would do at least 500-1000 chain punches at a time during solo training. We have been told to do the Biu-Tze form in a certain elastic fluid way, to exhaust ourselves with the various Biu-Tze strikes when doing solo training. We also train the Biu-Tze Chi Sau sections with partners. However, there is still a step that I haven’t been able to see quite as easily. When we are training Biu-Tze, is this a completely different movement pattern that negates all previous movements? Or is it a logical transition from SNT and Cham-Kiu (CK)? - When we are training SNT, I can see the relaxed yet solid flexible structure that we are to build. I can also see other aspects such as forward intent, wedges, decompression, etc. - When transitioning from SNT to CK, I can see the addition of not only the horizontal plane to dissipate forces with the solid flexible structure, but also other skills for disrupting the opponent’s rooting. However, when transitioning to Biu-Tze training, this step seems more challenging, as perhaps it should be. The connection was not as easily seen in my mind, compared to the evolution from SNT to CK. It seems more than simply adding the vertical dimension and all degrees of freedom in our movements and entries. That would still be merely a change in technique. I believe that one of the keys to improve Biu-Tze is to gain even further confidence in our SNT and CK abilities. This seems like a typical straightforward and logical answer about training anything i.e. the basics first. But, I don’t think it’s as simple as this training sequence. In order to be better at Biu-Tze, we have to keep returning to CK, and in turn, back to SNT. So, that if Biu-Tze fails, we have the built-in deformations from our previous training. Remember the idea of Biu-Tze being the emergency-response techniques? In actual fact, I think that the structure and deformations built from training Siu-Nim-Tau and Cham-Kiu are our actual emergency responses. To confuse things further, there is a Biu-Tze engine in our movements that should permeate the SNT and CK “techniques” as well, in application. Biu-Tze contains an advanced internal engine for movement. We still need the SNT and CK engines in place though. If they are working well, then we will have a lot more confidence in allowing Biu-Tze to express itself. One could say it is all just one engine, just improved sequentially, including beyond Biu-Tze with the Wooden Dummy and weapons forms. If we train the Siu-Nim-Tau or Cham-Kiu forms with the Biu-Tze movement pattern, is this wrong? For the most part yes, it would be wrong to train the SNT form with Biu-Tze-like movements. However, there is probably an intrinsic change in our movements developed from Biu-Tze that we cannot willingly change, at least easily. What I mean, is that if we purposely use the flexion/extension movements of the spine during the SNT form, then that would be, for the most part, wrong. At least wrong for the purpose of training the first form. Yet, the Biu-Tze training should hard-wire a new fluid movement pattern. While it will make all of the other aspects of our Wing Tsun better in application, it shouldn’t really change the fundamental core aspects of each of the forms when training. Because, they are each training different ideas and concepts. If we apply our Siu-Nim-Tau or Cham-Kiu techniques with the Biu-Tze movement pattern, is this wrong? I don’t think it is wrong to “use” Biu-Tze in a SNT “technique”. The fallacy in this question is again the speaking of techniques though. In application, theoretically the training of Biu-Tze already fundamentally changes our Wing Tsun (for the better). The training of Biu-Tze should improve a SNT or CK “technique”, just because of better movement patterns, angles, apparent pressure, position, directness, etc. Have you not noticed, that after training Biu-Tze, our punches improved? Is it possible to turn “on” and “off” different movement patterns? It may be possible to turn “on” and “off” Biu-Tze. But, this is likely easier only if we are in the consciously competent phase of knowledge. It would be more challenging to do, if we are in the unconsciously competent phase. As a teacher, it would be important to be able to demonstrate different movements to a student, when showing the differences between SNT, CK, or Biu-Tze. And the same could be said of the Wooden Dummy and the weapons forms. The caveat is that the internal structure and movements that are already developed cannot be able to be changed at all, and what is demonstrated is externally different visually. Well, that’s a glimpse into my thoughts so far about Biu-Tze. Next up, when comparing Siu-Nim-Tau, Cham-Kiu, and Biu-Tze, what is the difference in contact time, absorption, redirection, access, and countering? After reading the above, Si-Fu Ralph Haenel had some comments. Thank you! All six forms of the Wing Tsun Kung Fu system FORM us, our skills, but also change, influence our perFORMance. Right now we are only looking at a few brief ideas of the first three forms, the Siu-Nim-Tau (SNT), the Cham-Kiu (CK) and the Biu-Tze (BT). The following examples are divided into four categories and for the purpose of a quick overview, each category is kept short and simplified, cannot be complete. I have chosen Tan-Sau as a single technical tool, to show the evolutionary process through the forms. I often explain the forms as different gyms to gain and form different layers of functional strength. The techniques, the movements are your "weights", to train the different muscle-groups and their ability to generate force. For the regular student these different layers will form his skills as a martial artist. In my opinion, a good instructor should be capable to show a layered performance, defending and controlling and attacking, based on the different forms, one at a time. Each form also transports a different set of concepts, strategies and tactics. Often hidden in the technical drills of the various student and instructor levels. The student or aspiring instructor learns one layer at a time, yet should early on be introduced to the ideas of the programs ahead, to better understand the whole system of Wing Tsun. We will also be guided by our own preferences, as well as our personalities. This, plus your own martial artistic ambitions, as well as the intensity of your training will determine, which Wing Tsun "layers" will be dominant. blooded", has "rhythm in the blood", shows an exciting performance. You can now hold your breath until you turn read in the face. Sorry, won't make you "hot-blooded". So, ... In the words of the Bee Gees: Keep on dancing! Yeah!